So cute! I wanted to get started immediately. First I found adorable Forget Me Nots that I thought would go perfectly with the color of the cottage. I ordered a bunch from 32NorthSupplies also on Etsy. I'm not sure which ones I'll use they are all so sweet! I already put the main structure together. And I already made a purple chandelier to go inside. Thank you Kim for letting me use your cottage design as my inspiration! The purple chandelier is amazing. I like the new project. Hi Caroline! 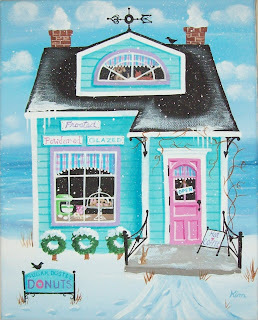 Thanks so much for that link to Kim's Cottage Art! I will be examining her site, that's for sure. 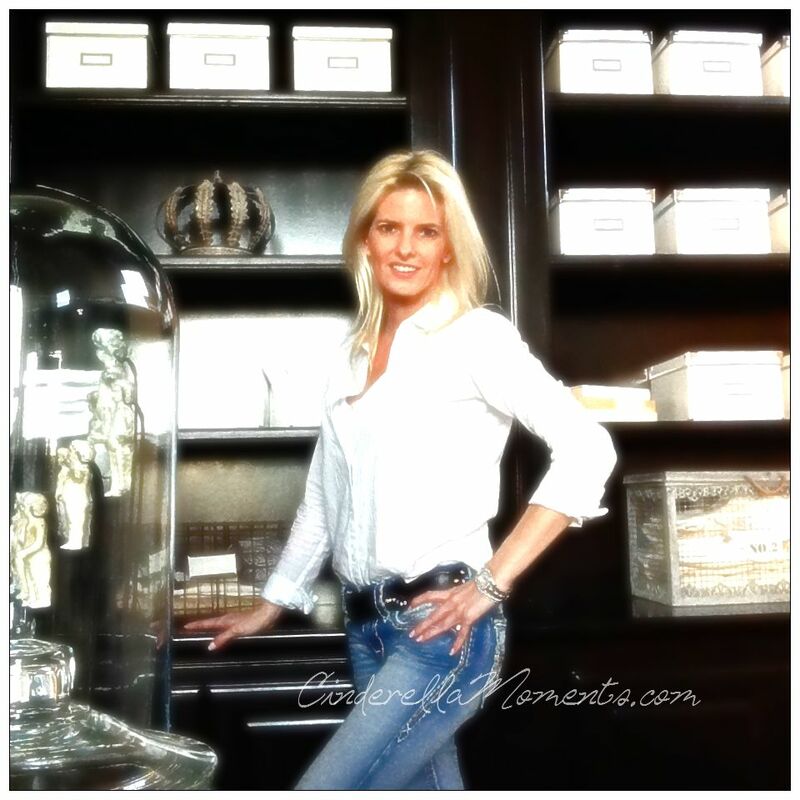 I have always had such a passion for anything to do with houses. Dollhouses, paintings, jigsaw puzzles! 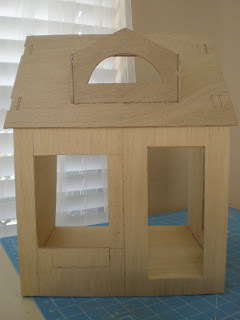 Your little house in the works promises to be so charming. I love your purple chandelier. I have a penchant for purple and lilac. I wear those colours so well. I'm excited to see what you will be doing to that little structure! It will be wonderful as all your another houses!!!!! 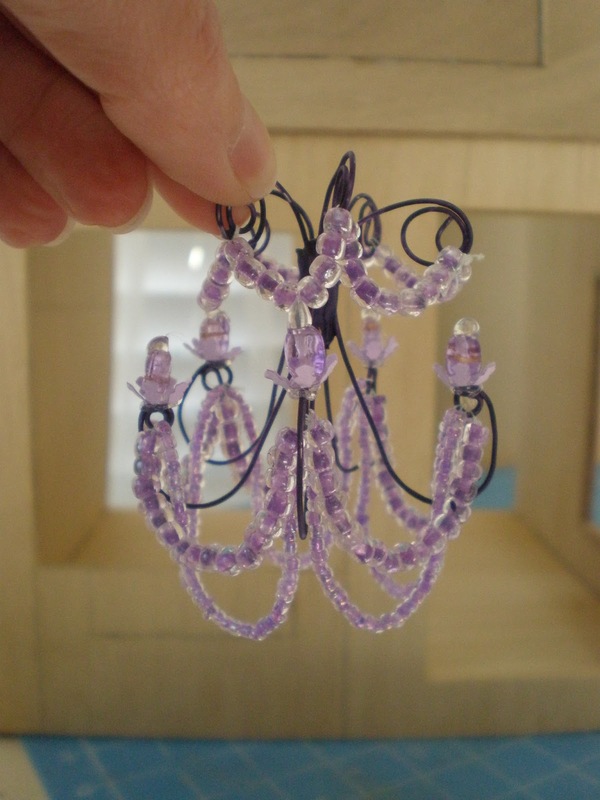 The purple chandelier is fantastic, i love it! Oh Caroline! It's so cool you get that kind of inspiration! It will be gratifying to see you 'give life' to another cottage. I am your fan and I love your work. Ya tengo ganas de verla acabada!!! Tus trabajos también me inspiran a mí,me gusta tanto tu trabajo!!!! Hi Caroline, I fell in love with your purple chandelier the minute I saw it. My favorite color. I can't wait to see your latest finish. Your houses are so awesome. Happy Valentine. Hugs from Your Missouri Friend. 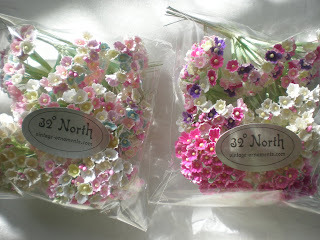 I love 32 North's flowers and supplies. Hi Caroline. Blue and pink - not the usual range of your houses. But away with the stereotypes! Freedom of imagination and new inspirations! I am very excited to see more of this wonderful project!!! I love the forget me nots and the purple chandelier!! I can't wait to see this shop!! Hi Caroline, first I won to thank you for the lovely link, what lovely cottages. Love the forget me nots and your lovely purple chandelier !!! He llegado justo para empezar a seguir tu nuevo proyecto, me encanta esa lamapara y su precioso color. I am in love with the purple chandelier!!! I am looking forward to seeing the finished cottage!! if you do it...that is for sure. Love the lavendar chandy, so cute! and all the lil flowers. such fun, can't wait to see the finished project.